Sunday December 6th 1891 It snowed nearly all day. I was not away from the house. I was busy all morning with the work and read in the afternoon. Will helped me work on the books all the evening. Monday December 7th 1891 We got the washing done this forenoon by a great hurrying. I left considerable for Mother and Josie to do while I went to town in the afternoon. Will took me in the sleigh. I was at the office to see Ott, he paid the note the firm owed me, $159.00. I took it to the Saving Bank and paid $200.00 on my note there. We worked on the books in the evening. Tuesday December 8th 1891 I was busy about the work all the forenoon. Mother went to town for the day. Will helped us grind sausage in the afternoon. I was too tired to do much of anything in the evening. The snow is melting away. Will sold some cattle. Wednesday December 9th 1891 I was busy with the dinner all forenoon. I fixed some things to send to Ida and did them up so I took them to town about four oclock. I called to see Aunty and met the girls there. Fanny went down town with we and Hattie went home. I took my package to the express office. I ate supper and spent the evening at Hatties. Will came over for me. Thursday December 10th 1891 I done some sewing this morning and in the afternoon. We done some washing. It was a pleasant day. I worked on my stand cover in the evening. 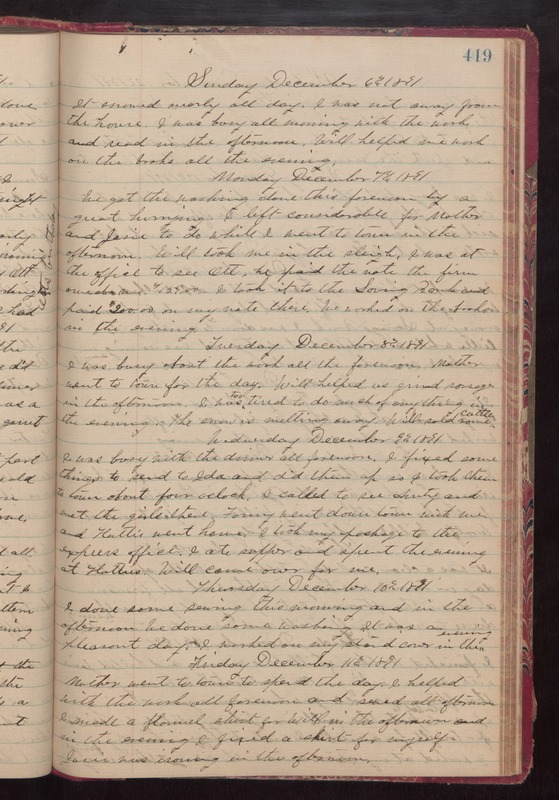 Friday December 11th 1891 Mother went to town to spend the day. I helped with the work all forenoon and sewed all afternoon. I made a flannel shirt for Will in the afternoon and in the evening I fixed a skirt for myself. Josie was ironing in the afternoon.